Composed by 17th Century French Carol. Arranged by Robert Myers. Post-Romantic, Christian, Sacred, General Worship, Christmas. Score, Set of Parts. 24 pages. Published by WheatMyer Music (S0.344927). Plenty of music is available for advanced ensembles, and some music is available for beginning and early music students. But what is available for a mixture of the two? 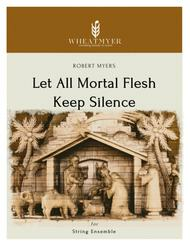 This arrangement of "Let All Mortal Flesh Keep Silence" aims to provide that solution. As originally written for an actual church ensemble with a mixture of professional, advanced amateur, and student string players, this piece can fit many different ensemble mixtures of a septet or larger. It features solo parts for violin and cello that will interest advanced players mixed with simple accompaniment by the ensemble at large. Whether you have a studio of mixed ability students, a faculty/student ensemble, or just a real-world church ensemble, this piece can work for you. 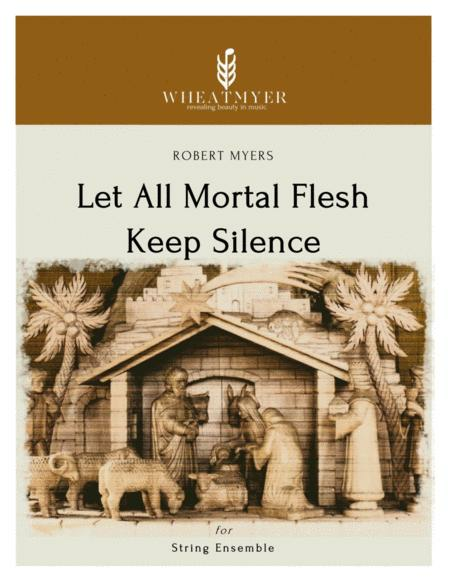 The hymn, "Let All Mortal Flesh Keep Silence" may have origins as far back as the 4th Century church, being long used both as a Christmas hymn and to focus worshippers on the mystery of the incarnation and the Eucharist. Thus, this piece is well-suited for Advent, Christmas, or any observance of communion. The tune, PICARDY, comes from a 1680 French song book.